Next month, representatives of nearly 200 countries will meet in Paris to try to reach a universal, binding agreement to address global climate change. Two of the biggest obstacles to such an agreement have been the fact that emissions of carbon dioxide and other greenhouse gases vary widely from country to country, and that many leaders fear limiting emissions could impede economic growth, particularly for newly industrializing countries trying to lift people out of poverty. One metric that ties both of those notions together is energy intensity – the total energy used by a country per unit of gross domestic product (energy consumption being closely related to carbon emissions). Though not without its drawbacks and criticisms, energy intensity is useful as a sort of Energy Star rating for an entire economy: All else being equal, you’d probably prefer to use less energy to generate a given amount of economic output. While energy intensity can be calculated several ways, for simplicity we use the version adopted by the U.S. Energy Information Administration (EIA): the total energy used by a country in a year (in British thermal units, or Btu) divided by the country’s GDP for that year (in constant 2005 U.S. dollars on a purchasing-power parity basis, so the data are comparable across time and national borders). 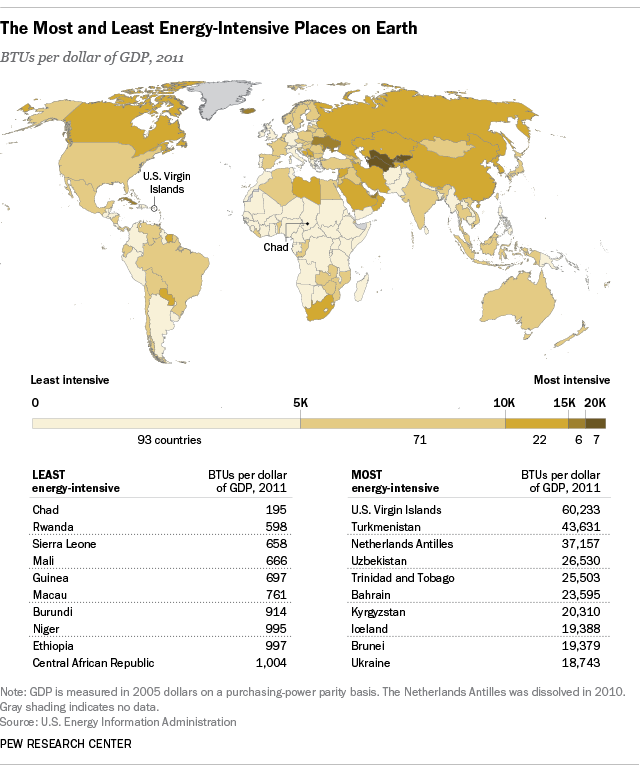 The resulting figure represents how many Btu the country used per dollar of GDP. Between 1993 and 2011, the most recent year for which data are available, worldwide energy intensity fell 18.7%, according to a Pew Research Center analysis of data from nearly 200 nations and territories compiled by the EIA; most nations (112) reduced their energy intensities over that time period. Many of the countries that have made the biggest reductions are former Soviet bloc nations (such as Azerbaijan, Estonia and Slovakia), which historically were very energy-intensive. While several factors likely were responsible, one significant one appears to be the post-1989 decline of steel and other heavy industries and the subsequent closure of many inefficient plants. Conversely, many of the countries where energy intensity has increased since 1993 are developing economies that are industrializing and/or extending their electricity grids, such as Benin, Laos and Cambodia; to the extent that new power plants use coal, natural gas or other fossil fuels, greater energy intensity implies higher carbon emissions. Most of the countries with the lowest energy intensities in 2011 tend to be poor, largely agricultural nations in Africa. Chad, whose GDP per capita last year was $2,082 (according to the World Bank) ranked last out of 199 countries and territories in energy intensity, using less than 195 Btu per dollar of GDP. But there was one notable exception: Macau, a special administrative region of China, used only about 761 Btu per dollar of GDP but still has one of the highest per-capita GDPs in the world: $133,341 last year. The secret? Macau’s economy is dominated by casino gambling and other hospitality- and tourism-related businesses, which generate vast amounts of cash ($44 billion from the casinos alone last year) while using relative little energy (all those flashing lights and ringing bells notwithstanding). Among OECD nations, Iceland, Canada and South Korea are the most energy-intensive, while Estonia, Ireland and the U.K. are the least. Estonia, in fact, reduced its energy intensity the most of any OECD member state: a 59.8% decrease since 1993, largely due to structural changes in the country’s manufacturing base. That brings up an important point: Energy efficiency is not the only factor in determining a nation’s energy intensity. Structural changes in an economy – the industrialization of an agrarian society, say, or a developed nation’s manufacturing sector shifting away from energy-intensive industries such as steel-making and chemicals – can increase or decrease energy intensity. So can changes in people’s behavior, such as moving toward warmer or colder regions or choosing apartments rather than single-family detached houses, as well as demographic changes (women bearing fewer children, multiple generations living under the same roof).